As I have mentioned here many times before, Sunday is when I make an elaborate dinner – it is the sole day of the week when Renata and I have the chance to sit down together to eat, enjoy a glass of wine or two and watch a movie. This tradition of sorts started during the early stages of our relationship: as I remember, I asked her if she preferred to go out and eat at a restaurant or if she preferred me to make her a home-cooked dinner. To this day I have no idea why she chose the latter, but from then on we did that almost every Sunday save when there is a gig or when we are not in town. Weekdays, however, are another story: due to my work and study schedule, there is no time for such luxuries. I cook quick and easy meals that can go into a container and into the fridge for our consumption the next day – I have a small list of meals that I make with non-fussy ingredients like canned beans, pasta, sausages, cuscus, rice, frozen vegetables and things like that. However, that doesn’t mean I don’t improvise from time to time. When I’m planning what to make, say, on a Tuesday afternoon (I teach mornings and evenings and actually go home for lunch and try to write a bit while I’m there), I sometimes peek into the fridge and pantry and wonder what I could make with what I already have in stock. Frankfurters, canned corn, rice and tomatoes? That could become a German risotto – actually a real recipe, one of the earliest I learned when I began my wonderful journey into the world of cooking. Before you start wondering if I am going to make a dish out by simply emptying my refrigerator into a large pot and make a thousand-egg omelet inspired by the kind they make on Fat Tuesday in Ponti, Italy, that is just not the case. But I do enjoy improvising a little with leftover ingredients that I bought to make something over the weekend and seeing what the result might be. This brings us to my latest ‘invention:’ I have known how to make pasta fagioli for quite a while, but I was wondering what would happen if I made it into something different by switching a few ingredients and giving it my personal touch. The result was quite satisfactory – and Renata agreed, since she sent me a text message showing her appreciation the moment after she finished her lunch. Penne rigate with blackeye peas, celery and tomato. Dried basil, salt and pepper to taste. Cook pasta according to package instructions in salted water. Drain, reserving about a cup of the cooking water. In the meantime, heat half the olive oil in medium heat and cook the sausages until slightly browned. Add the onion and garlic and sauté until fragrant. Add the remaining vegetables and simmer until softened and remove from heat. 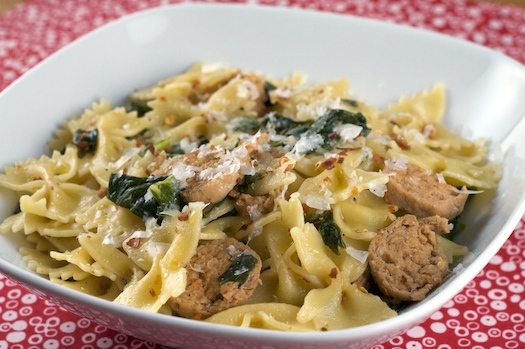 Toss the pasta with the sausage mix and the reserved cooking water. Serve topped with a drizzle of the remaining olive oil.